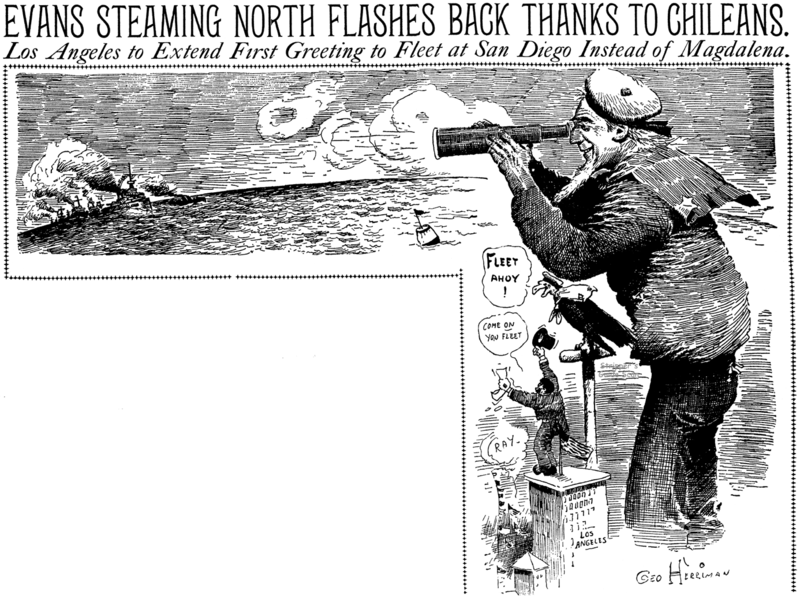 Sunday, February 16 1908 -- The Great White Fleet is underway from it's last South American port of call, and headed up the coast to California. Every coastal city in California is clamoring to receive the fleet. Despite entreaties to President Roosevelt himself, the fleet will not moor at San Diego but outside the bay at Coronado. Navy officials are too worried that the fleet could be mired in muck in San Diego Bay. Angelenos are readying a big reception for the fleet themselves, though their arrival is still a long ways off. The late 1960s to mid-70s was a time when 'relevance' tried its darnedest to invade the comic strips. Whether advancing a social or political agenda, young cartoonists all seemed to have Something Important to say. Not that there's anything wrong with that, but if all these relevant strips had been picked up by papers, it would have been like reading a page of a social studies textbook every day on the comics page. The key, of course, is to get your point across with humor. 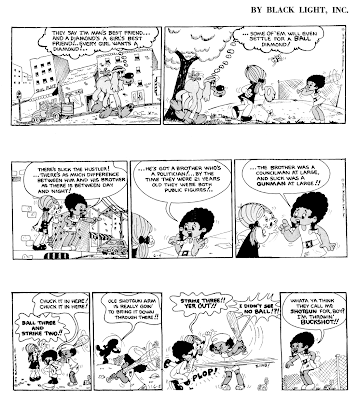 Doonesbury and Pogo were masterful at combining humor with relevant content, and Wee Pals, appealing to a less sophisticated demographic, got its point across with a smile. 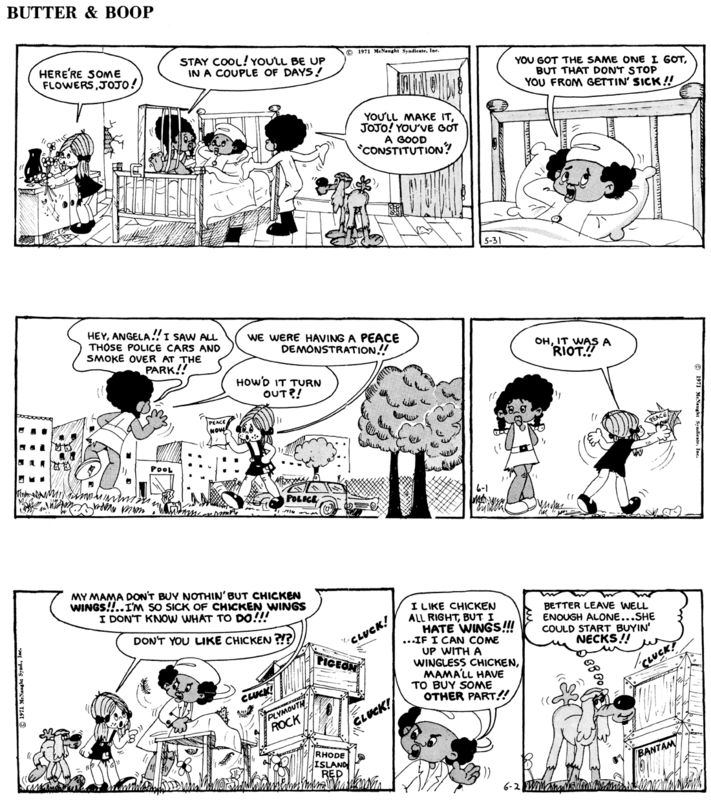 Butter & Boop is an example of a comic strip that tended to forget that nagging problem of being funny. And no wonder -- the comic strip was begun under the aegis of Black Light Inc., an inner city arts project that was sponsored by a do-gooder starch magnate (yes, there really is such a thing). The studio began in 1968 with a full complement of budding artists, but most drifted away until there were but two -- Louis Slaughter and Edward J. Carr. For reasons that seem a little misty in the retelling, these two guys, who seemed to have basically no interest in comic strips, began producing Butter & Boop. 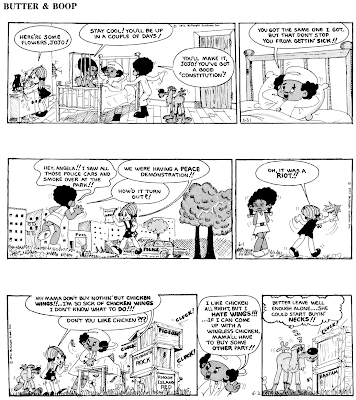 With starch money buoying up the self-syndicated operation and a big-hearted magnate encouraging these guys to "tell it like it is", a few papers were found to take the daily strip, which first appeared on May 15 1969. The samples above are from two years into the run, and you'll have to take my word for it that the quality of the strip had already improved by leaps and bounds. The early stuff is quite militant and pugnacious in its desire to 'expose' inner city life to suburban newspaper readers. Although that flavor is still there two years later, Slaughter and Carr were toning it down and trying to entertain a little instead of beating readers over the head. It was at this point that they were able to interest McNaught Syndicate in distributing the strip. McNaught took over syndication on May 17 1971. Despite the marketing push of a major syndicate, the strip found few new takers. 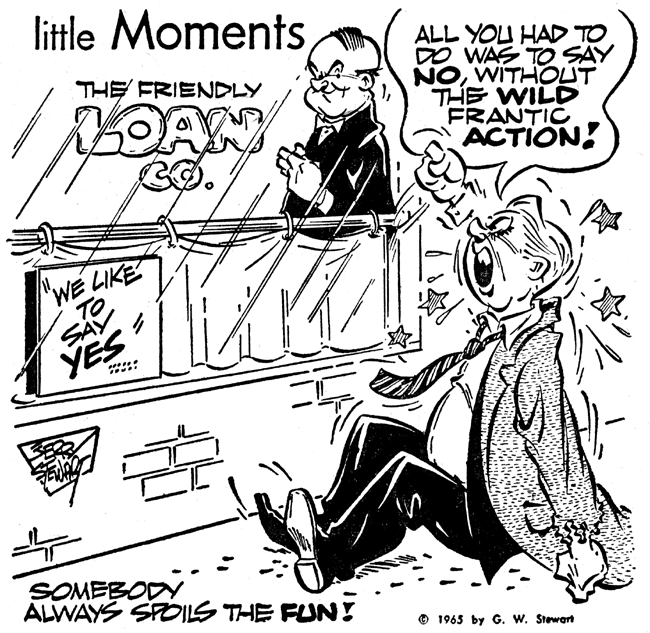 The fact that the strip was still a little on the rough side, and that the similarly themed Wee Pals was in its heyday were the probable obstacles. Butter & Boop was with McNaught for a bit over two years; they seem to have parted ways in August 1973. 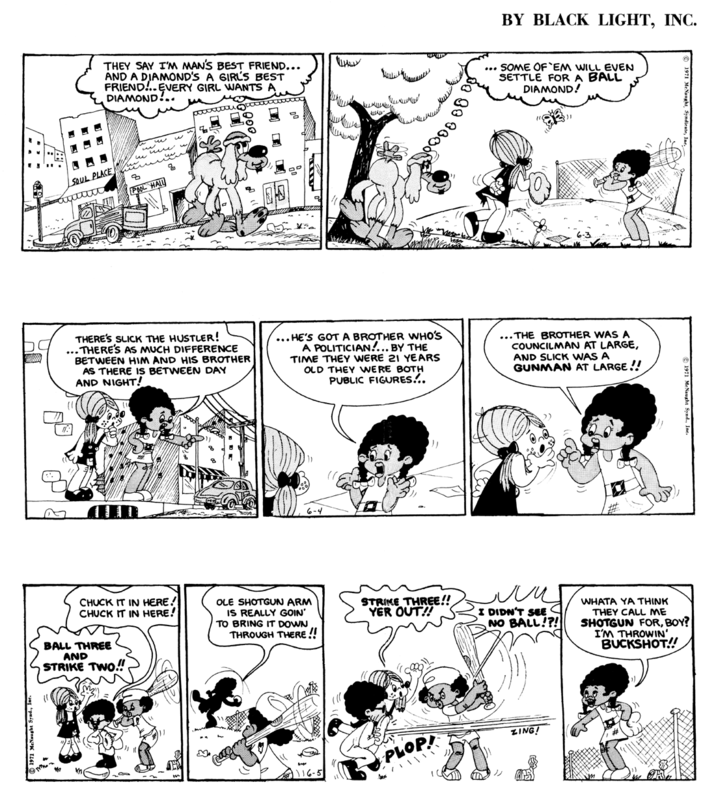 The creators commented later in a February 1974 Ebony feature article that they didn't feel the syndicate did enough to market the strip and so they went back to self-syndication. At that point the strip becomes really hard to find. Reading between the lines of the Ebony article the strip may have been down to two clients, the Kansas City Star and the Nashville Tennessean, neither of which I've had an opportunity to check. In the Ebony article, the creators seem to be saying that self-syndication was too much of a drain on their time and that if a syndicate couldn't be found then Butter & Boop was not going to continue much longer. The last indication I find that it was running is a citation that the co-creators got a Lord Calvert Whiskey Men of Distinction award in 1975. Butter & Boop ran in the PHILADELPHIA TRIBUNE at one time, and also the DELAWARE COUNTY DAILY TIMES (Chester, Penna.) ran it from 17 May 1971 until 15 September 1973. I love the drawing style. 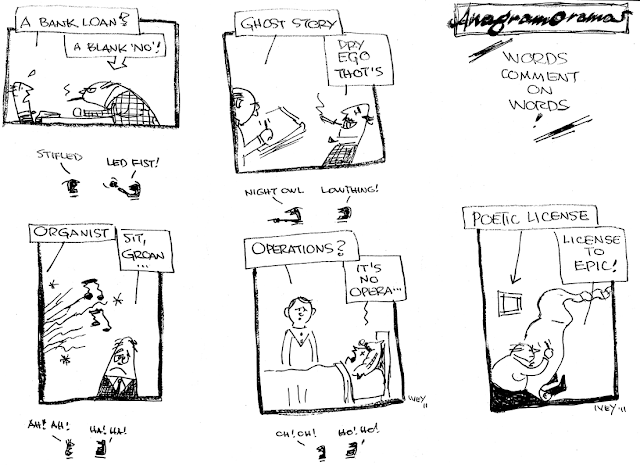 I saw some strips in the Tennessean microfilm archive. I wonder how long they ran it. Just stumbled in here looking up "Butter and Boop." For anonymous, the age of Louis Slaughter was about right although I suspect that he might have been a couple of years older. I went to school with Louis and his brother, Michael, for a year or two in the Kansas City area in the early 1950s. As I recall, they moved to the area from Lexington, MO. I Have 18 of these strips can you tell me more info on them?what they would sell for and who to contact about these strips please? Gerald W. "Jerry" Stewart was born in Pine Bluff, Arkansas on May 18, 1923, according to the Social Security Death Index and an obituary in the Fort Wayne News-Sentinel (Indiana) on October 30, 1995, which said "he moved to Fort Wayne one year later." In the 1930 U.S. Federal Census, Stewart was the oldest of three children born to William and Evelyn. They lived in Fort Wayne, Indiana at 1823 John Street. His father was a "car repairman" for a "rail road shop." Polk's Fort Wayne City Directory 1937 listed the Stewart family at 327 Melita Street. The U.S. World War II Army Enlistment Records, 1938-1946, at Ancestry.com, show Stewart enlisted on February 26, 1943; he had two years of college; his civil occupation was porter; his height was 65 inches and weight, 124 pounds. Polk's Fort Wayne City Directory 1945 recorded Stewart and his father on page 493. After Stewart's initials it said "USA" which, I think, referred to his service in the Army; he was a resident at the address. His father's listing included his mother's name, his father's occupation as repairman for the Pennsylvania Railroad, and home address. Indiana's Laughmakers: The Story of Over 400 Hoosiers: Actors, Cartoonists, Writers and Others (1990) profiled Stewart and wrote, "Stewart joined the News-Sentinel as a copy boy on March 25, 1946. He was promoted to staff artist three months later." The News-Sentinel obituary said, "Stewart was the first minority hired by The News-Sentinel and was a pioneer in the newsroom." His listing in Polk's Fort Wayne City Directory 1946, page 547, was, "Stewart Gerald W (Manda R) artist News Pub Co r327 Melita". Stewart married some time in 1945 or 1946. His listing was the same in the following years through 1949. Polk's Fort Wayne City Directory 1950, on page 539, recorded him as, "Stewart Gerald W (Amanda R) artist News Pub h915 Horace". 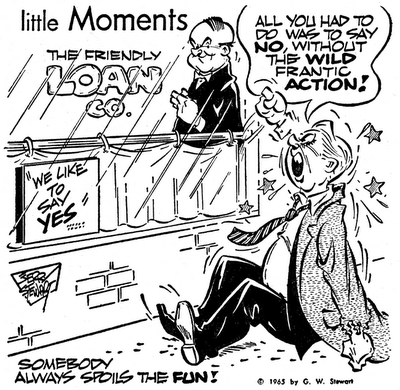 His comic panel, Little Moments, debuted in 1961. Stewart passed away on October 29, 1995, in Fort Wayne, according to the Social Security Death Index and News-Sentinel obituary. I remember seeing Stewart's cartoons quite often when I was growing up, but I have to confess that his style didn't appeal to me back then. He had at least one or two books published locally, and it was always interesting to know that we had a real, live, local cartoonist amongst us. 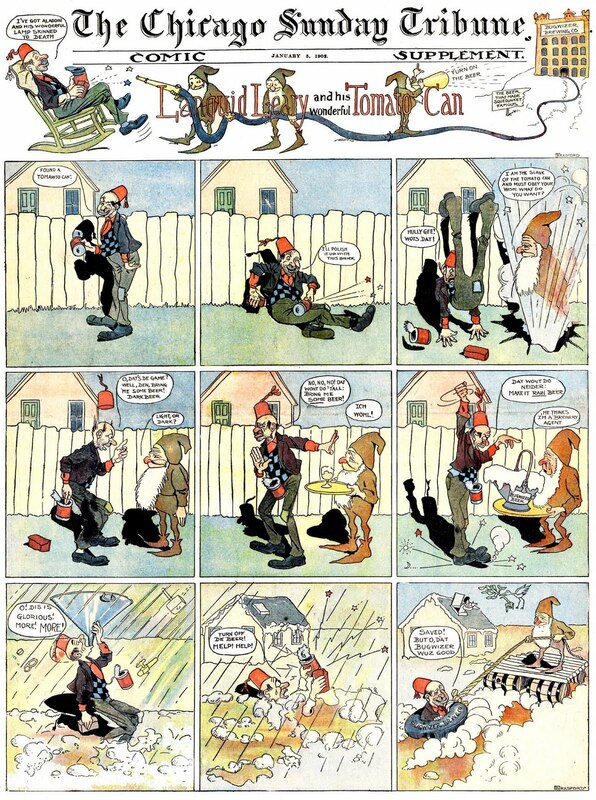 Walter R. Bradford, the creator of those inimitable cartoons of the "Pickleweights," "Scow," "John Dubalong" and "Jingling Johnson," which featured for so many years in the daily pages of the North American, died at his home in Philadelphia, June 4th, of tuberculosis, against the inroads of which he had courageously fought for months, arousing the admiration of his associates by his heroic cheerfulness and unabated flow of humor. The closing down of the North American, however, was a severe blow to him, as it seemed like a separation from all that he had so delighted in for years. His desk had become his playground as much as his workshop. When his newspaper passed to the hands of the Public Ledger, Bradford was the radio editor, and his creations in that role were of the same subtle humor which characterized his exploits in other roles. Walter Bradford was 53 years old. He was born in Dayton, Ohio, and began work in the Studebaker Carriage Works, at South Bend, Ind., but his inherent talent for sketching led him to attend the night classes for instruction in drawing and inadvertently to the [missing text] John T. McCutcheon [missing text]. He worked for some time on the Chicago Tribune and the North American, shifting to theBaltimore Herald, finally settling down again with the North American. Bradford's whole soul was in whatever he undertook and he enjoyed the children of his own brain probably as much as those who eagerly waited for their performance in the daily issue of the paper. Mr. Bradford said he loved his work and got fun out of his characters as if they had actuality. Enoch, Maria, Dill Pickleweight and Scow, the black cat. Walter Bradford's cartoon-sketches had an individuality. His characters remind us of the characters of Charles Dickens. 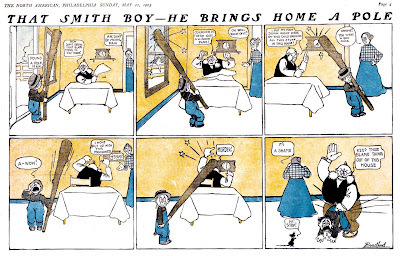 They not only were intensely humorous, but they had that touch which made them real, reflecting the traits and frailties of human nature with geniality and sympathy, which made them more than comic representations, for Bradford had a fine mental organization and a subtle apprehension for the best in human nature, which he reflected in his cartoons. There was never anything cynical, for his sympathetic, kindly nature was foreign to anything pessimistic. Bradford was well read in English literature and could discourse on authors and analyze in a way that would have given him renown as a literary critic. He was an expert photographer and a pictorialist and his work possessed individuality of treatment, reflecting his peculiarity of temperament and his judgment in selection. 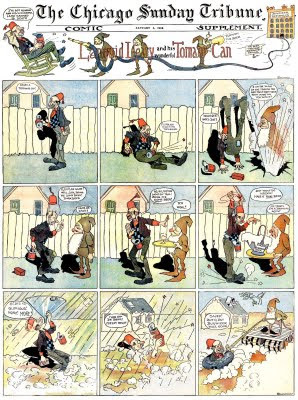 He contributed papers to The Camera, written in his humorous style and illuminated by most original photographs, and arrangements were being made for his connection with the editorial staff when the sad news came of his death. Walter Bradford's ability as a critic in art rendition by the camera gave occasion frequently for invitation to serve on jury awards, and his decision evinced sane judgment in analysis. While insistent on the necessity of conformance to the time-honored rules and principles of art, he was broad in his views and appreciated all the advances made by the new photography, and was unbiased in his estimation of individuality of expression. Although he never put his own work in competition, it was characterized by possession of taste and originality and emphasized by the personal equation. His literary contributions to the photographic journals were instructive, though instruction was conveyed in an Aristophanic way, which was most delightful, accompanied by illustrations intensely funny, but hitting off to perfection the idiosyncrasies of pictorial cults. He is survived by his widow, who was born in England, and his son, William Bradford. [Walter R. Bradford was born in Dayton, Ohio in May 1872, according to the 1900 U.S. Federal Census and numerous obituaries. In the 1880 census, Bradford was the youngest of five children born to Harry and Sarah. They lived in South Bend, Indiana at 46 General Taylor Street. His father was a painter. In 1900 Bradford lived in Chicago, Illinois, at 301 Osgood Street, with his wife Sara, of six years, and son William. His occupation was recorded as typewriter. (Bradford's playful sense of humor at work!) At the Chicago Tribune, he produced Animal Land and Languid Leary and his Wonderful Tomato Can, and helped out on the strip Alice's Adventures in Funnyland. 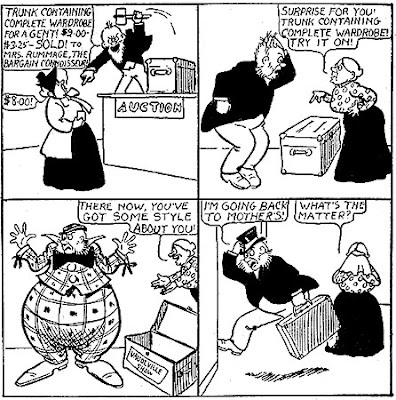 Some of his strips for the Philadelphia North American were Doctor Domehead, Tommy Tuttle, The Geteven Youngsters, and Fitzboomski the Anarchist. More Walter Bradford today! 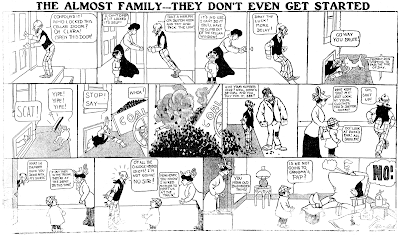 This time The Almost Family, a Sunday strip he did for the Philadelphia North American from July 22 to November 25 1906. A relatively simple slice-o-life strip featuring a family with constant bad luck. I'd like to point out an example of the subtle little things that, to my mind, set apart a great comic strip creator from a hack. 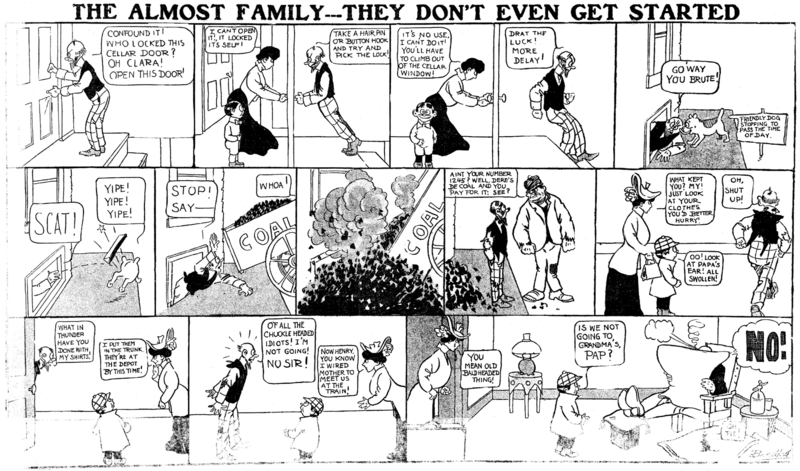 Notice in the top strip that we never actually see poppa getting walloped by the coal man. Instead Bradford lets us fill in the blank by having Junior comment on dad's new cauliflower ear. A small point, surely, but when you read as many bad comic strips as I do, that sort of little thing is thrilling. It's a nod to the reader's basic ability to make a simple inference that few comic strip creators, even today, seem to grasp. When Junior makes his comment, the reader takes a beat and in a moment a mental image of pater saying something smart to the coal man and getting a knuckle sandwich in return is conjured. Draw the reader in, make him a co-conspirator -- good advice for any cartoonist, or for that matter, an artist of any stripe. Thanks to Cole Johnson for the samples! I just heard that Cole is in the hospital, going into surgery this morning. I'm sure all Stripper's Guide readers join me in sending Cole best wishes for a most positive outcome and a speedy recovery. Here's a real serious obscurity by one of my favorite funny page pioneers, Walter R. Bradford. Bradford's work is usually certifiably nutty, really inventive and off the wall. That Smith Boy, however, is none of those things, which probably explains why Brad dropped it after just two episodes in the Philadelphia North American. The first (shown) ran on May 21 1905, the second and last on June 4. It's of the "mother-babies-the-kid, father-bears-the-brunt" school, popular at the time. Brad figured out really quick that there was nowhere interesting for him to go on the topic. I love these. More, please, sir.